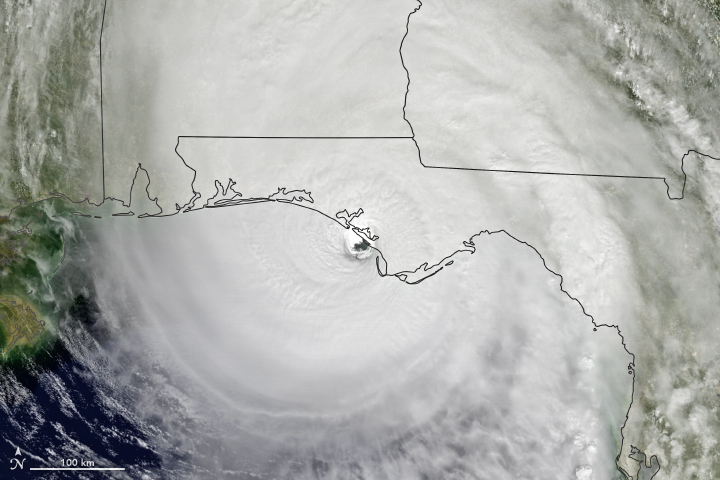 At approximately 1:30 p.m. Eastern Daylight Time (17:30 Universal Time) on October 10, 2018, Hurricane Michael made landfall near Mexico Beach, Florida. 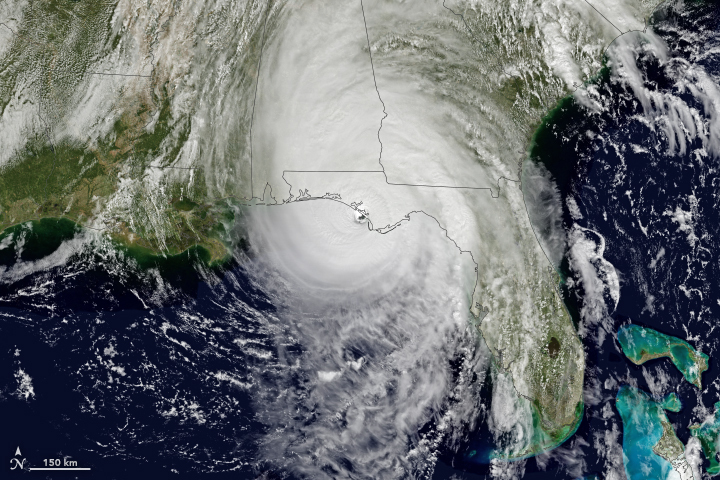 Wind speeds were estimated to be 155 miles (250 kilometers) per hour, which would make the category 4 hurricane the strongest on record to hit the Florida Panhandle. The storm has already destroyed homes and knocked out electric power in the area. 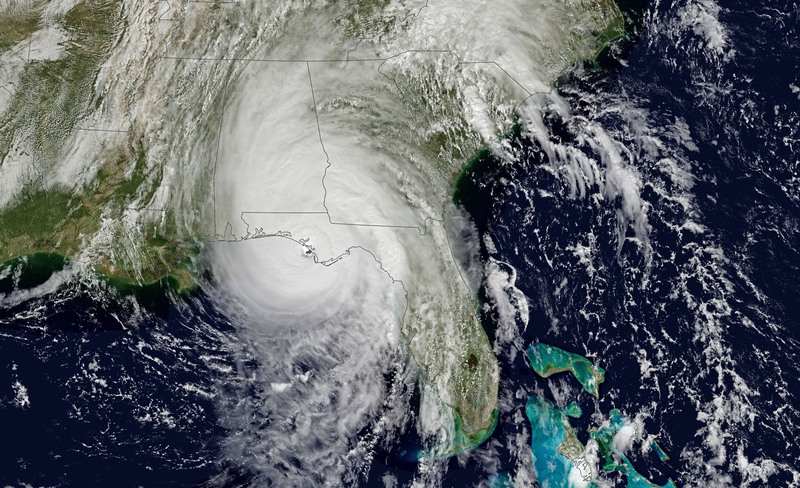 Forecasters expect Michael to bring heavy winds and rain to the southeastern United States for several days. The Geostationary Operational Environmental Satellite 16 (GOES-16) acquired data for the composite images above around 1 p.m. Eastern Time on October 10. GOES-16 data (band 2) were overlaid on a MODIS “blue marble.” GOES-16 is operated by the National Oceanic and Atmospheric Administration (NOAA); NASA helps develop and launch the GOES series of satellites. The National Weather Service office in Tallahassee issued an extreme wind warning as the storm approached. Forecasters were expecting large storm surges—rising seawater that moves inland as it is pushed onshore by hurricane-force winds. The worst surges were expected to inundate areas between Tyndall Air Force Base and Keaton Beach with 9 to 14 feet of water on October 10. As the storm moves inland, forecasters expect life-threatening winds to also affect parts of Alabama and Georgia. Areas as far as southeastern Virginia could see several inches over the next three days. North Carolina has declared a state of emergency as the storm forecast has it passing over areas that were affected by Hurricane Florence last month. NASA Earth Observatory images by Joshua Stevens, using data from GOES-16. Story by Kasha Patel. This entry was posted on Friday, October 12th, 2018 at 5:25 am and is filed under NASA, Tropical cyclones, Tropical storms .